Transparency Market Research has published a new report that offers an in-depth study of the global metrology services market. The report, titled “Metrology Services Market - Global Industry Analysis, Size, Share, Growth, Trends, and Forecast, 2012 - 2018”, is available for sale on the company’s website. This report offers a comprehensive overview of the global metrology services market by highlighting the strengths, weaknesses, opportunities, and threats faced by this market. The biggest growth driver of the global metrology services market is the high adoption rate of CAD/CAM and rising implementation of international quality standards. Other factors contributing to the growth of this market are the shortage of skilled labor to operate precision machines and the poor utility value of the existing measuring equipment. In addition to this, accumulation and analysis of 3D data is also propelling the global metrology services market. 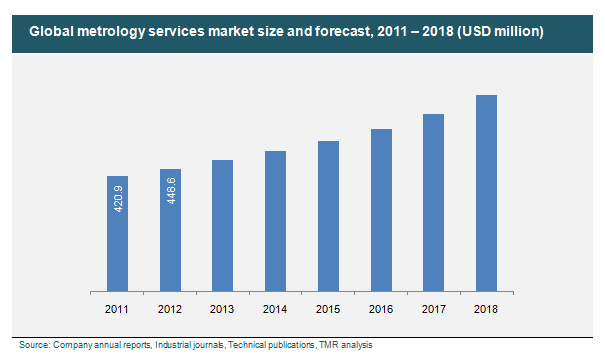 According to the report, the global metrology services market was worth US$448.6 mn in 2012 and is estimated to be worth US$720.3 mn by 2018, growing at a CAGR of 8.2% from 2012 to 2018. The global metrology services market is segmented on the basis of product type, applications, and geography. The types of products in this market are coordinate measuring machines (CMM) and optical digitizers and scanners (ODS). Coordinate measuring machines are further sub-segmented into bridge machines, gantry machines, articulated arm machines, and horizontal arm machines, while the optical digitizers and scanners segment is sub-segmented into white light scanners, 3D laser scanners, and laser trackers. The applications of metrology services are in the automotive industry, the aerospace industry, industrial sector, in power generation units, and others such as the medical industry and electronics industry. Geographically, the global metrology services market is segmented into North America, Asia Pacific, Europe, and Rest of the World. According to expert research analysts, the fastest growing product in the global metrology services market is ODS. This segment is expected to grow at a CAGR of 8.9% to reach a valuation of US$435.8 million by 2018. In 2012, 3D laser scanners accounted for 35.1% of the overall metrology services market due to growing usage of precise measurements and touch probe technology. Furthermore, analysts also predict that coordinate measuring machines will grow at a CAGR of 7.2% in the forecast period. The report gives an insight into the competitive landscape of the global metrology services market by profiling some of the crucial players. The ones profiled in this report are Renishaw Plc, Hexagon AB, Optical Gaging Products, Inc., Carl Zeiss Corporation, Trescal SA, Nikon Metrology Inc., Danish Micro Engineering A/S, Optical Metrological Services, and FARO Technologies, Inc. The report dedicates a chapter to profiles of these companies, highlighting their financial overview, investment plans, list of services, and their research and development activities.